Sometimes we want to use a single database for web and desktop version. In those case we need to work same task, same interface, class, method in web version and desktop version.In those case we may need to use a same method in web again desktop. Again sometimes we need to work a partial part in web and another part in desktop. For example: In those case we may need to use a same method in web again desktop. In the above web and desktop part we may need to use a same method in web again desktop. In those case we can use Web Service to make more reusable. But web service has different task. First I am discussion about Web Service. Why we need Web Service? 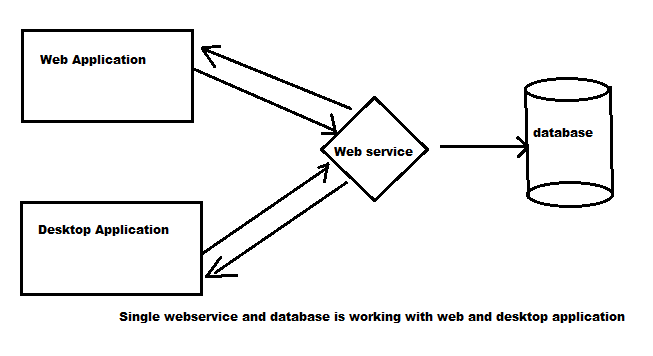 How Web Service works in .net web application and desktop application? Web service is a technology framework, which allows machine-to-machine (M2M) interaction over the network. It can call application component. This protocol communicates with XML. It is not tied to any one operating system or programming language. The main reason to be popular of web service is because with web service, each application like PHP, C++, VB, C# etc. must adhere to a set of standardized protocols for sharing and accessing data. This way, two programs can speak to each other, regardless of operating system, database or programming language compatibility. Instead, everyone agrees on a set of rules by which these interactions will take place. This distinct feature is called Service-Oriented Architecture (SOA). The client program bundles the client page information into a SOAP message. The Web Service unpacks the SOAP request and converts it into a command that the application can understand. The application processes the information as required and responds with a new unique data’s. Next, the Web Service packages up the response into another SOAP message, which it sends back to the client program in response to its HTTP request. How I use Web Service in .net web application and desktop application? First user application and web service middle ware makes SOAP message and communicate over HTTP. We can say that SOAP as a message format for sending message between applications using XML. It is independent of technology, platform and extensible also. In the solution create two project, one for web and another for desktop. Create method to get data from database. In the above method I just use normal query to get data from database. Again also create a method for insert data in database. In ASP.NET code behind create a method to insert and get data through webservice and store in datagridview. Now add ok button. The webserver will be include. Add a new form. Add a new method in code behind of form1. The same database is using for web and desktop application.